Having run quite a few races over the last couple years, people often ask me what my favorite race is. 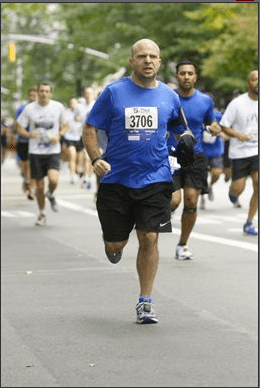 Having run quite a few 5ks, half marathons and marathons, I have a good perspective on different races, especially in New York, but I often say that my favorite race is the Fifth Avenue Mile. The Fifth Avenue Mile, as the name suggests, is a single mile running down Fifth Avenue in Manhattan. 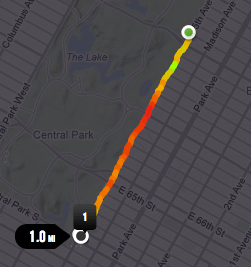 Starting at 80th Street and running straight down to 60th Street. The first quarter mile or so is a gradual hill that leads into a plateau that begins its descent at the half mile marker. Not an overly complex course, but one that can be a challenge for those of us who do not train for such short races. My Nike+ GPS watch had died during the Bronx 10 Mile race the week before, so I wasn’t able to use my watch to pace myself. I was using my iPhone to record my run, but could not look at it with it strapped to my arm during the race. I was able to see the times as I reached each of the quarter mile markers, noticing my time on the course and surprised at how much time had passed between each as it seemed to go much quicker than it actually was. I was able to cross the finish line in 6:17, a marked improvement over last year’s time of 6:49. The most amazing part of it was how I felt after running the mile. I’ve spent a couple years now conditioning myself to run long distances, but my conditioning didn’t prepare myself for pushing myself all out on a single mile. I was out of breath and unable to to even drink anything for a few moments, like when I ran my first 5Ks and half marathons. A bit humbling to be brought back to my roots when simultaneously getting my PR for a single mile. All the training I’ve been doing with Team Determination for this year’s ING NYC Marathon have really paid off, as I’ve seen by my PRs in both single mile and half marathon races in September. Now, I am a little more than a month away from the 2012, and you can help support me and the American Cancer Society here as I run to support this worthy cause!